Dyes in History and Archaeology (DHA), an international group of experts with multidisciplinary backgrounds, has met every year since 1982 to discuss chemical, analytical, biological, historical and technological aspects of natural and synthetic dyestuffs. The papers presented will be published by Archetype. 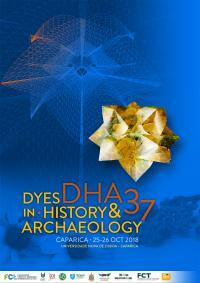 The 37th Dyes in History and Archaeology Meeting will take place from 25-26 October 2018 in Portugal. The oral and poster sessions will be held at Caparica Campus, near Lisbon. The meeting will be organized by IST (Universidade de Lisboa), Diocesan Museum of Santarem (Diocese of Santarem), the Department of Conservation & Restoration and Requimte (NOVA Faculty of Sciences and Technology) and Instituto de Estudos Medievais (NOVA School of Social Sciences and Humanities). Contributions to the conference should be related to dyes and their role in human culture, chemistry and characterization. Papers of an interdisciplinary nature that apply technical findings and analytical evidence to cultural issues are especially encouraged. Wider discussions of issues such as origin, trade, symbolism, and aesthetic function are also welcome. Technical papers concerning other aspects of dyes will also be considered for inclusion in the conference programme. The topics presented will be of interest to conservators, curators, art historians, craftsmen, artists and scientists. If you would like to present a contribution at the conference, please submit an abstract of no more than 500 words by email to dha37@campus.fct.unl.pt and mjm@fct.unl.pt by 15 July 2018. Please indicate whether you would prefer to make an oral presentation or a poster. The fee for the two day conference (including the welcome reception, tea, coffee and lunches during the conference, and the book of abstracts) is 150 EUROS for registration before 15 September 2018 and 170 EUROS thereafter (until 15 October 2018). For extra fees (gala dinner, optional tour, etc. ), please see the registration form.